Purling Sprite : Happy 30th indeed! When you driving you have to thing only about the road. Driving is a real test for us! Every new driver who passed the drivers license test needs to practice certain things.And not only new drivers,all of them!!! MAZEL TOV! That's fantastic! What an incredibly brave thing to do. I loved turning 30 and I hope this year is only the beginning of great adventures for you - in and out of the car! Congratulations!! So glad you passed, especially on your birthday! Way to go girl! I knew you would pass. I totally enjoyed this story. Happy birthday to you! Mwah! happy Birthday! And congrats on the license! Now you can go shopping whenever you want! Mwa ha ha! Oh, congratulations, Isela! We knew you could do it!!! And happy, happy, happy birthday. It sounds like a terrific way to break in your 30s. May it be your best decade yet! Congrats! I knew you could do it. I am glad that you had a fun and memorable 30th. 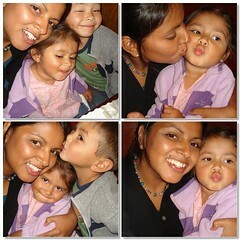 The smoochy face picture of you and the kids is so adorable. Hi Isela! I loved this post. Kind of brought me back to the day I took my test : ) Only you probably already read how well that went! I loved reading about your sweet family greeting you after your test. Thanks for giving us a window into your life. I think a lot of us have come to know you through these posts and consider you a friend : ) Have a great day! Congratulations!!!! Good job...you go girl! ;o) My mom didn't get her driver's license until she was past 50 and I know it's hard! Even though I've driven since I was a teenager going through helping my mom and then later helping our teenagers with the driving test I know how nerve wracking it can be on everyone! We are all so proud of you! Happy, Happy Birthday! Congratulations!!! I'm so proud of you! You can accomplish anything you put your mind to. I hope you see that! What a wonderful birthday you had! I loved reading all about it. Felt like I was there. I'm so happy for you! CONGRATULATIONS!!!!! Wonderful Isela!! Happy Birthday, happy driver's day :) Your story made me laugh and touched my heart too. Congratulations on passing your test!!! Always a big day, no matter what age you happen to be. Also, Happy Birthday!!! Ever since picking up my first loom (like two weeks ago) I have been sold on this fantastic method of knitting. I have to say, your site was one of the first I found and helped me out tremendously. Now I have ordered a Wonderloom and can't wait to move on to new and better projects. So I am super excited to get to say thank you and Happy Birthday and congratulations all in the same day. Happy Birthday!! And Congrats on passing the test! I remember taking the test and I felt the same way. Sounds like you did just great! I was well into my 20's before I got my driver's license, and I did fail the first time, but that was many thousands of miles ago now. Congratulations!!!!! How exciting to get your driver's license on your 30th birthday! I'm glad to hear you did better than a lady I read about in my local newspaper who backed into her driving instructor after she got back to the testing center after her road test (obviously she failed the test), LOL! Now you can drive around to all the local yarn shops and replenish your stash you sold to buy the car, LOL! Yay for you! Congratulations! What a great birthday present.